L’Rell, Ash, and Pike face a tough decision with the arrival of a new signal. Time has become of great importance to Star Trek: Discovery, as its second season races to a dramatic conclusion—and with it, questions of fate and destiny. Tonight’s episode brought those issues to the forefront...although whether it did so successfully depends on who among the Discovery crew you might ask. 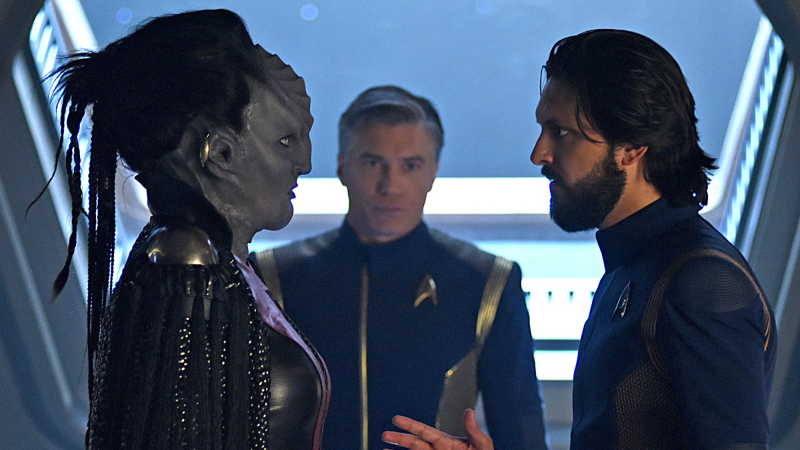 Compared to the last time Discovery attempted to split itself between two conflicting plotlines, this turns out to be a far more effective story, thanks to the tighter focus on two of the most important characters on the show this season, and the fact that their arcs are intertwined in the same question of what fate actually means to the two characters. But in examining the idea of predestined fate in Pike and Burnham, Discovery also finds itself once again above the pitfalls of its own position as a prequel series to the original Trek—and turns navigating those pitfalls into dueling stories of success and failure. L’Rell serving looks as she meets Captain Pike. Let’s start with the one where it doesn’t quite work: Captain Pike’s, as he finds himself playing host to Chancellor L’Rell when a new signal appears above a Klingon world called Boreth. Boreth raises a lot of complications for L’Rell and Ash (or rather Voq, but let’s just keep on rolling with calling him Ash for clarity’s sake), because it’s the location of the monastery where the duo sent their young son for safekeeping earlier this season. It was a sacrifice made so L’Rell could maintain control of the Empire and keep the peace with the Federation—so any interest brought by the signal could expose that she didn’t really lose Ash and her son during the attempted coup back in episode three. But, of sudden and great convenience to the plot, the Boreth monastery just so happens to be home to a naturally-occurring resource of Time Crystals, and Captain Pike wants in, desperate to find some way to get an edge over Leland and Control. Instead of risking the chance to expose L’Rell and Ash’s secret, Pike chooses to go down to Boreth and parlay with the monks in an attempt to get access to a Time Crystal himself. And while he gets to see the timey-wimey effect the crystals have on the planet, like rapidly growing trees (and the eventual revelation that his guide around the Monastery is none other than L’Rell and Ash’s son Tevanik, magically grown up from tiny Klingon Baby into wise old monk over a matter of months), he also has to make a pretty terrible choice...one that brings back the stark realization that sometimes Discovery cannot help itself when it comes to playing with its connections to the original Trek. Pike steels himself to witness a future that he cannot change. Because while the monastery is more than willing to let Pike take a crystal, doing so has dire and personal ramifications for the Captain himself—the minute he touches a crystal, Tevanik warns, he locks himself into witnessing a glimpse of his own fate. A fate that, apparently, cannot be undone once he takes the crystal—and one that we as an audience know cannot be undone, because for us, it’s already happened. Yes: Star Trek: Discovery finally gets to have its Pike and eat it too, showing us—and Pike—the infamous accident that will transform the Captain of the Enterprise into the scarred man we met in “The Menagerie” back in 1966. The event is a harrowing experience for Pike, and one that clearly has had a profound impact on him by the episode’s end. There’s great dramatic tragedy in seeing Pike make the noble choice—the Starfleet choice, perhaps—that permanently shackling himself to an unplanned destiny is worth gaining access to a way to potentially defeat Control and save the universe. But it’s an incredibly bleak one, a distressingly jaded one, to inflict on a character that we’ve been reminded throughout this season is the walking embodiment of Starfleet’s most hopeful and noble ideals. Pike now gets to spend the next 10 years of Star Trek history burdened with the fact that his career will end in painful, debilitating injury. To shatter that hopeful idealism by making Pike directly aware of the fate we the audience have been meta-textually aware of since the beginning, just for the cheap thrill of Discovery getting to say “look, we got to make the beep-boop machine in 2019, it’s like the one you remember!” and seemingly little else? It seems like a distressingly disappointing path to take Pike as a character down. Spock, Gant (or really, Control-Gant), and Michael beam aboard the wayward Section 31 ship. But it’s also a choice completely undermined by the fact that Michael’s journey in the other primary plot of the episode invites her to learn the exact opposite lesson about the control she has over her own fate. After Saru grants her permission to chase down a Section 31 ship that shows signs of having fallen under Control’s...well, control, while Discovery (and the sphere data it has left) avoids any potential interaction with the A.I., Michael finds herself joined by her brother Spock on the away mission, much to her sisterly annoyance. And while the two bicker—mainly thanks to an emotionally wounded Michael not wanting to be analyzed by her brother, despite the fact she just went through a similar thing with him—over whether or not she can be the key to stopping the seemingly inevitable fate of Control’s victory, their mission teaches them that, actually, she very much is. After a close encounter of the Not-Borg-kind, Spock teaches Michael a valuable lesson. It’s a great coming together of Spock and Michael’s arc over these past few episodes, one where, just as she had sought to do for him, Spock takes the turn of rooting his sister in a moment of emotional and logical turmoil. But, when contrasted with Pike’s storyline elsewhere in “Through the Valley of Shadows,” what it has to say about fate and destiny with Michael just makes the decision to make our own foreknowledge of Pike’s future part of the text, and part of his character, all the more disappointing. In being reminded that even a seemingly pre-determined fate can be challenged, Michael is given a moment of hope in her time of mourning for her mother, while at the exact same time, Pike is robbed of that hope by being told that he’s shackled to a dire fate he cannot and will not escape. It’s a conflicted message for the episode to draw, a conflict that only comes about for the sake of a momentary nostalgic buzz of getting to see Pike’s “Menagerie” future rendered in the modern design world of Discovery. Stamets might be busy moping over Culber, but the rest of these dorks have got word games to play! So if it’s not Gabrielle making the signals—and seemingly might never have been—who is it that’s trying to guide Michael in such a specific way? Speculate wildly in the comments section, but I have a feeling that evolving the entire Kelpien species just so Saru can be a little more gung ho in letting Michael run off on her own missions hints that it’s not exactly going to be as friendly a face as her mom.